The myth of an ultra-exclusive nightclub once buried away under the Mercer Hotel has been circulating the streets of New York for years. And now, after being closed for over five years, The Submercer—legendary for its celebrity-packed parties— is open for business. To get there, pass the Mercer Hotel (no. 147) and enter a little nook in the wall (no. 147 1/2). You'll know you're there when you see two unassuming henchmen hanging out in front of a doorway—just walk on by and enter the industrial freight elevator. Two floors underground, cruise down a long dark hallway stocked with bathroom supplies, turn left, pass the boiler room and then turn right through a heavy red door. One more hallway filled with wine and the faint sounds of lounge music will lead you to the promised land. 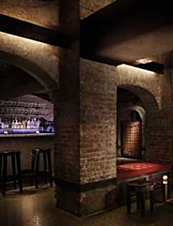 You'll find a small, dungeon-like club with exposed-brick walls, beautiful waitresses in matching cocktail dresses, low ceilings and small archways separating three narrow rooms. Bypass the main chamber with the bar and head to the smaller back room with its red walls, red banquettes, classic cocktails and...red stripper pole. 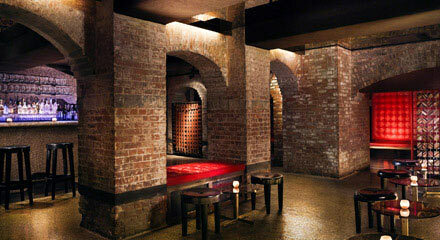 (It's a sort of deep underground champagne room.) Now all you have to do is sink into one of the banquettes, summon a Southside from your waitress and enjoy the fruits of your long journey underground. Until, of course, you have to find your way out.